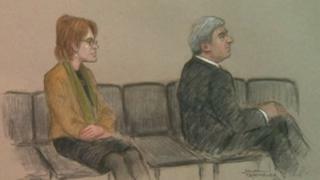 Former energy secretary Chris Huhne and his ex-wife Vicky Pryce have appeared in court to face charges of perverting the course of justice. The hearing at Westminster Magistrates' Court came after the Crown Prosecution Service looked into claims about a speeding incident in Essex in 2003. Mr Huhne, 57, resigned from the cabinet after the announcement on 3 February. The Lib Dem MP for Eastleigh in Hampshire has indicated he intends to plead not guilty. During the court hearing, the pair spoke only to confirm their names, dates of birth and addresses. Both were granted unconditional bail and neither has yet entered a plea. The case was adjourned to 2 March at Southwark Crown Court. The CPS decision to obtain summonses against them followed an eight-month investigation by Essex Police which involved taking a national newspaper to court in order to force it to disclose information allegedly related to the case. The CPS has said it was alleged that Ms Pryce accepted responsibility for a speeding offence in Essex in order to spare her husband penalty points on his licence. The charge against Ms Pryce alleges that she "falsely informed the investigating authorities" she had been the driver of a vehicle, enabling herself "to falsely admit responsibility" for a speeding offence. The charge against Mr Huhne alleges he "falsely informed" the investigating authorities that Ms Pryce was driving the vehicle, "enabling her to admit responsibility for the offence". Mr Huhne immediately resigned from his job as Energy Secretary following the CPS announcement, saying that although he was innocent, he wanted to "avoid distraction".